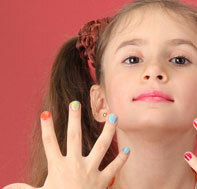 Tidy hands, tidy nails – a basic manicure to file and shape, soften and tidy your cuticles and a massage of the hands. A nail polish of your choice is optional. Just as above, we’ll compliment with a hand scrub to exfoliate, a luxury mask with heated mitts to accelerate absorption, plus a hand and arm massage with a polish to finish. Tidy feet, tidy nails – a basic pedicure to file and shape, soften and tidy your cuticles and a massage of the feet. A nail polish of your choice is optional. Go ahead and treat yourself to a Deluxe pedicure – Performing a shape and buff to the nails and a tidy up of the cuticles. We will exfoliate with a foot scrub followed by a luxury foot mask with heated booties and a foot & leg massage using a foot lotion to penetrate, moisturise and protect. A basic shape of the free edge and tidy up of the cuticle area plus a nail colour of your choice. A tidy of the cuticles and a buff & shape of the natural nails. Night out? Or just wanting glamorous toes? Have your nails shaped and polished choosing from a great selection of stunning designs and add sparkle with diamantes. Differing from our Pedicures. Breaking down hard skin and helping condition broken skin using a medically assisted acid peel to treat affected areas. Includes skin filing and massage to complete. This treatment is an extra special treat. Helps with blood circulation and medical conditions like arthritis and rheumatism.